I thought it would be fun to share with you some of my most prized heirlooms. These "prizes" happen to be handcrafted by my Dad. 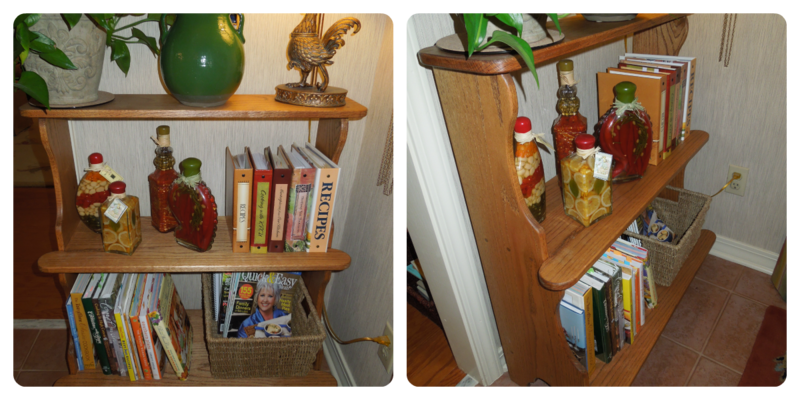 I am thrilled to have each of the pieces and especially now that my Dad can no longer do wood crafting. He was stricken with Guillian Barre Syndrome 18 months ago and lost a lot of the dexterity in his hands, plus he still lives with a lot of pain and discomfort and is not able to stand for long periods of time. It does make him happy to know that my older brother has taken his shop tools and is now enjoying being creative with them himself. It seems as though he must have inherited Dad's wood crafting ability. 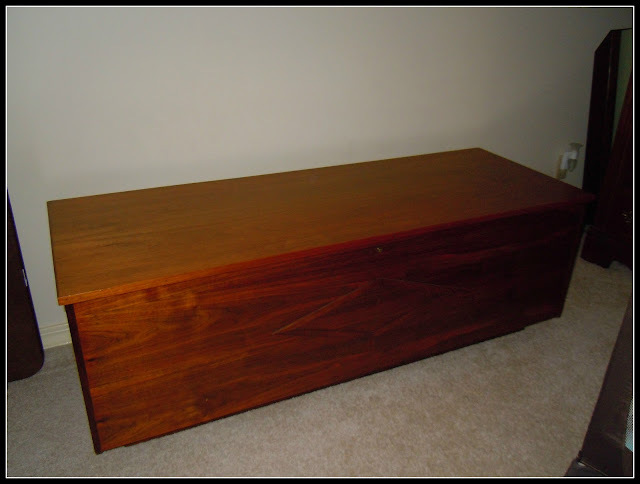 The first item my Dad ever made for me was a "Hope Chest" when I graduated from high school. 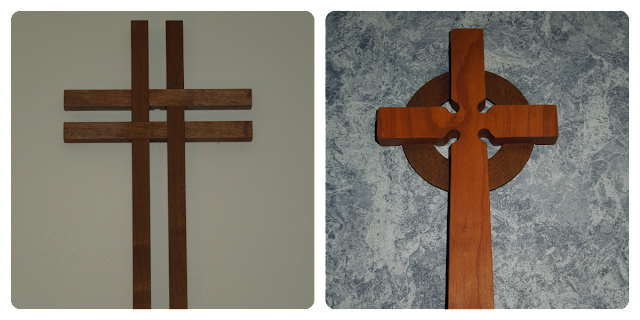 It is made of solid walnut and lined in cedar. These pictures do not do it justice, and if you look close you can see where he routed my name with a heart on the inside of the top. ~Yes, now you know, my middle name is Beth.~ Anyway, I have used this chest since the day he gave it to me and it makes the best place in the world for sweater storage. 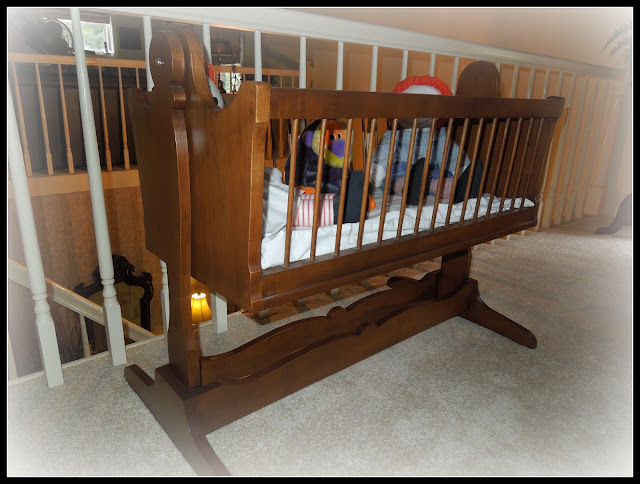 The next piece he made for me was this cradle when I was pregnant with our first child. It was made from the pattern of an antique reproduction. Our son actually slept in it for a couple of weeks and one day it will be passed on to him. It is also made out of walnut. I hope that you can see that it is crafted with perfection, as was all of Dad's work. This is a 30 minute hour glass made of mahogany. It serves as quite the conversation piece since it is large and a most unique piece. I saw a picture of this little shelf in a magazine about 8 years ago and asked Daddy is he could make me one like it and he went right to work and it holds a very special place in my kitchen. It is made of oak. It is made out of oak as well. This is a quilt rack also made of oak. 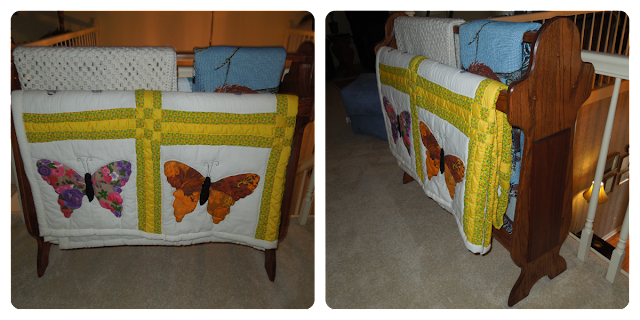 It is a very large piece, very substantial and will hold up to 6 quilts. He also made both of our children one of these. 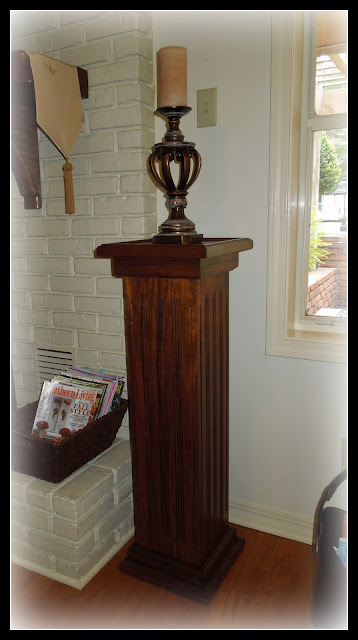 This is a matching pair of columns that sit on either side of our fireplace. They are one of my most favorite pieces and are made of walnut. Now, don't you just love this Fleur de Leis? 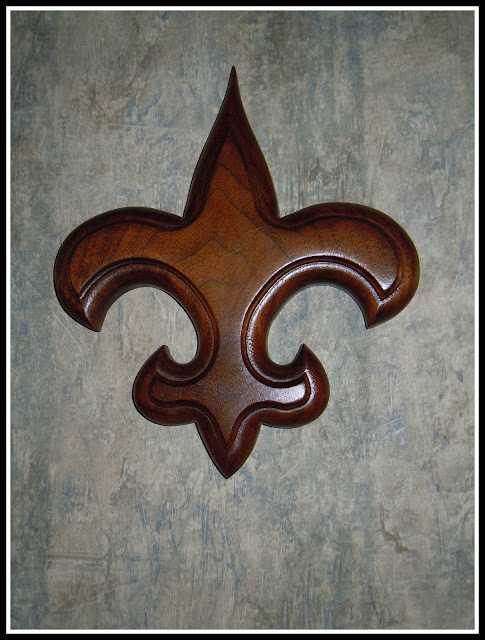 It is sort of the symbol of Louisiana and hangs proudly in our foyer. 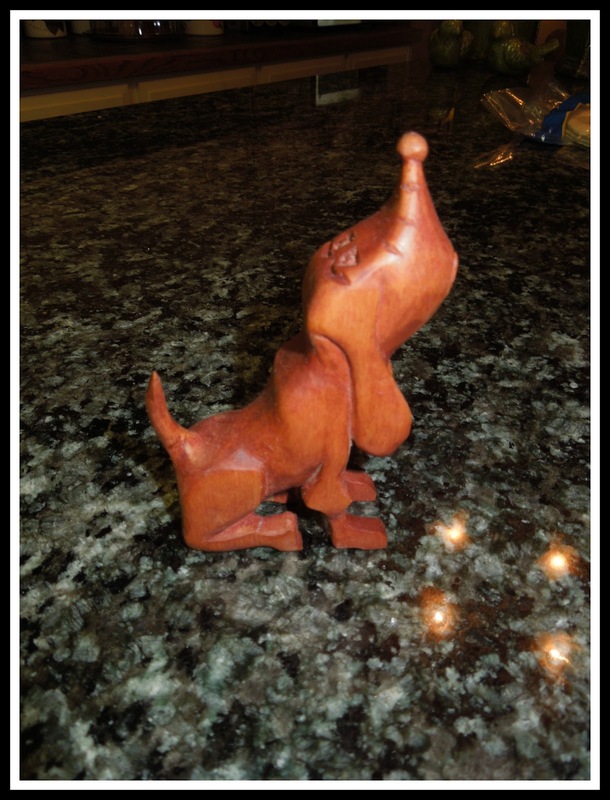 Daddy has also carved over the years and this little hound is a result of some of his carving. I thought he was so cute and asked if I could have him. I think he was sort of just playing when he made this fella, but he's such a cutie! 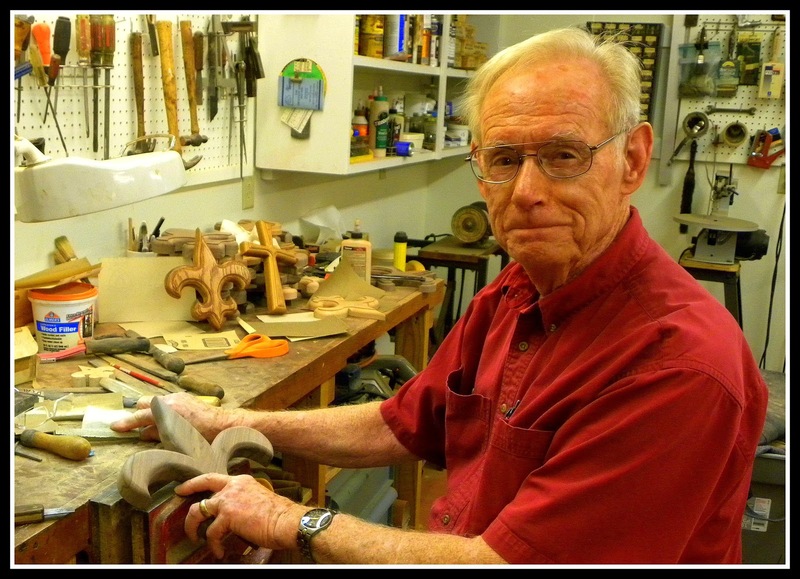 Speaking of carving.......he has also carved many wooden spoons over the years. This is a BIG spoon and will reach down into my deep soup/stew pots and the flat edge allows me to scrap the bottom of the pan very easily. 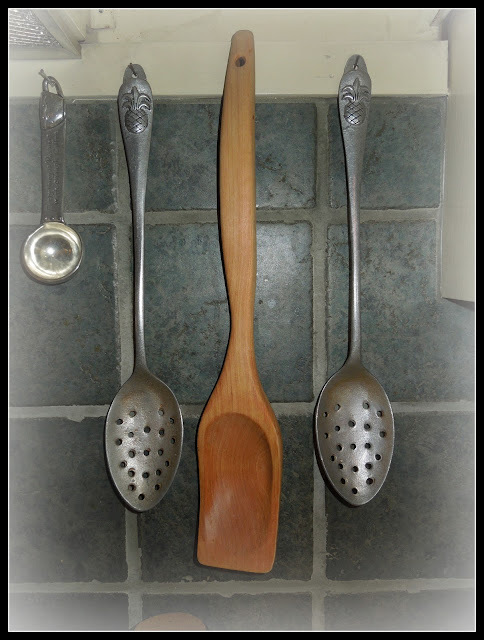 Daddy called it a "spatula spoon." This is made of maple. This is what I call a "fern stand" but could also be used as an all occasion table. 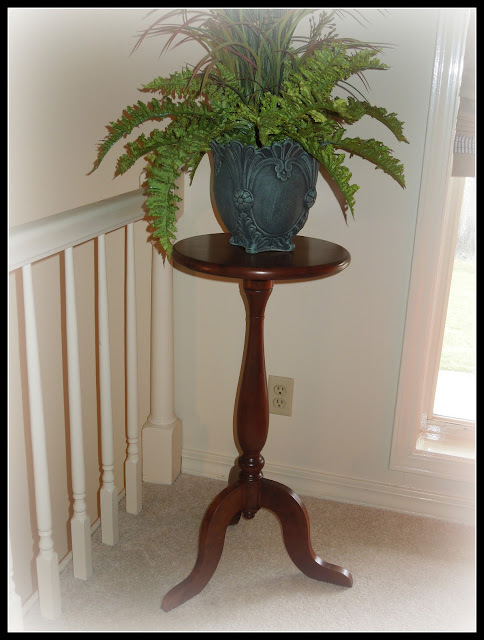 It is made of mahogany. 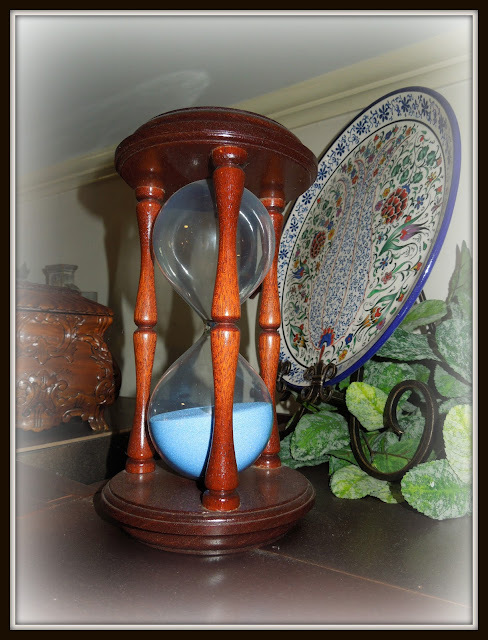 I hope you have enjoyed seeing these heirlooms as much as I have enjoyed showing them to you. It is this type of item that has priceless value. I treasure each and every piece and hope that when these are passed on to my children they will remember the man whose hands crafted them with love. 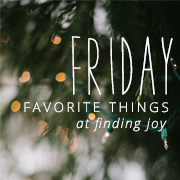 I'm linking up with Rachel this morning for Friday Favorites. Good morning! I can certainly see why you would treasure these. Just beautiful. But knowing that they were crafted by your dad makes them priceless as well. Enjoy your week-end! I love the little hound dog.Well I am proud to say I have one of your Dad's pieces hanging in my home. He makes beautiful things! Those pieces are beautiful, absolutely beautiful! And because they're made by your dad's hand makes them priceless. Wow, those are spectacular. What a wonderful gift he has. Oh Lea, what treasures! 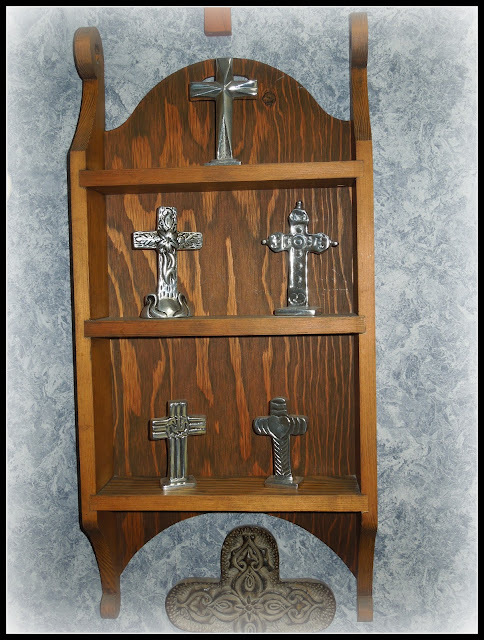 I have some of my dad's woodwork pieces as well and they are indeed priceless. Thank you so much for sharing them as your favorite things today. Loved it! What an amazing talent your father has. Works of art! I know they are treasured by you. what a gift he has for creating! i truly enjoy the cross we have. it's such a beautiful gift and reminds me of you. nothing better! xoxo. 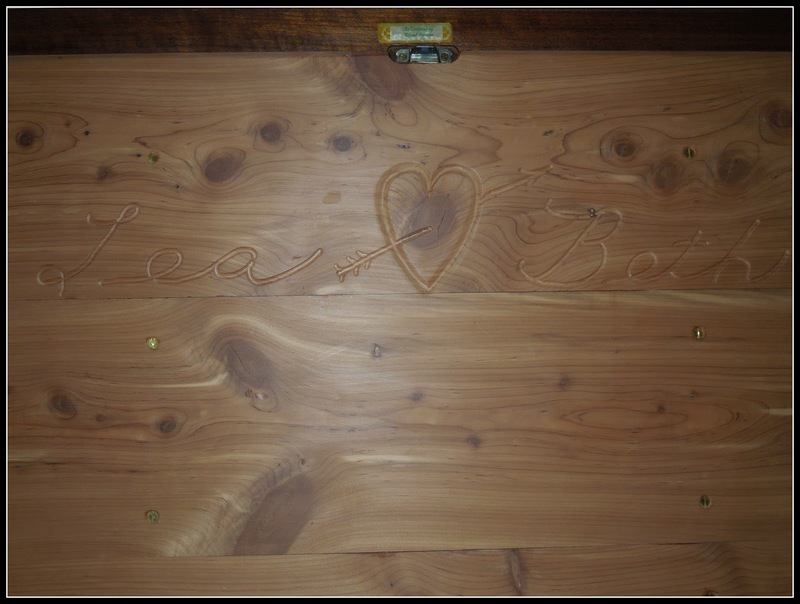 My grandfather used to do woodwork, and I treasure the things I have that he made me!! Mu husband's grandfather - who is 98 and healthy as can be! - made the very same cradle for him when he was a baby. My 9 month old son slept in it when he was brand new. How cool to see the same one here! Oh Lea, what beautiful heirlooms to have. The hope chest and cradle are especially beautiful! Lea Beth, what a pretty name. I admire all these wooden treasures. 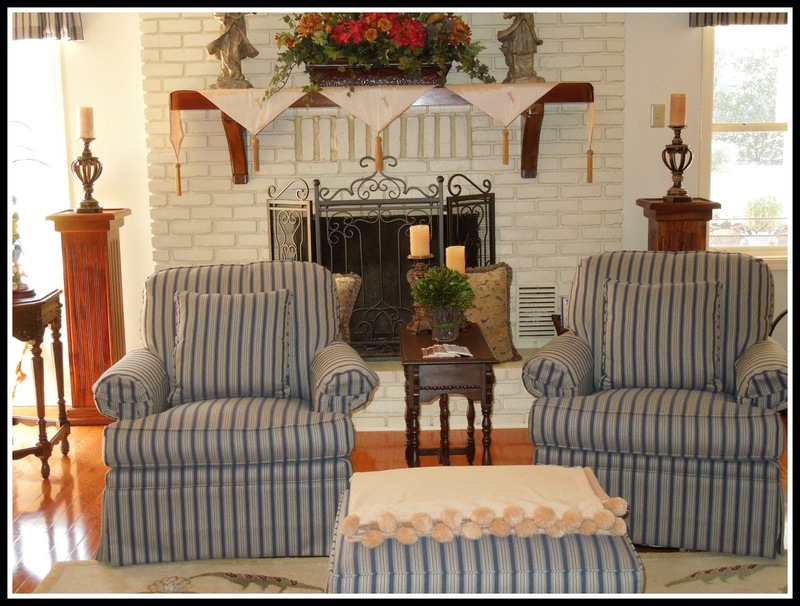 I especially like the fireplace columns and little hound dog. How special that your dad made so many different kinds of practical pieces. I enjoyed looking at these treasures of yours. My Peepaw made me a hope chest and it is a treasure for sure. He was not sure he would be able to finish it by Christmas the year he gave it to me b/c of some health issues but he did. He has been gone several years now and I am so thankful he made it for me. He put a little inscription on the top too with the date and "sweetheart" (his name for me).